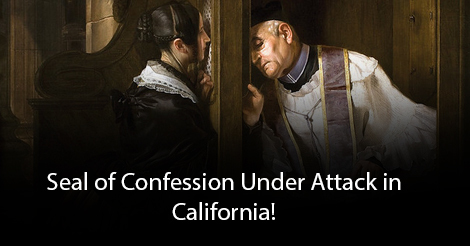 California attacks the Seal of Confession again! The Seal of Confession is under attack in California. Last week, Senator Hill (D -San Mateo), introduced a bill, SB-360, which would break the Seal of Confession by ordering “clergy to make a mandated report [to the State] even if they acquired the knowledge or reasonable suspicion of child abuse or neglect during a penitential communication. It should be noted that such a measure has no precedent in American law. Even secular professionals enjoy confidentiality with their patients and clients. We cannot remain silent when the Church and the Seal of Confession come under attack. Confessors under Communism and Nazism suffered prison, torture, and execution rather than break the sacramental seal. Catholics must stand up for their God-given right to believe, profess and practice their Catholic faith in full freedom, without improper government interference. The state had absolutely no business inside the confessional. The Seal must be absolute, between the priest, the penitent and God. American Catholics must unite and react to keep it that way. All authority comes from God, the Lord of Heaven and Earth, and human laws cannot oppose Divine Law. “There is no authority except from God, and those that exist have been established by God” (Rom. 13:1). To: Sen. Hill, Toni G Atkins (President Pro Tempore of the California State Senate), Anthony Rendon (Speaker of California State Assembly), Governor Gavin Newsom. I vehemently protest this unconstitutional initiative, which violates the most fundamental right of California Catholics to practice their faith without government interference.